The Inland Waterway is a 40-mile long historic water route that begins north of Petoskey and with a series of rivers and lakes connects Conway, Oden, Alanson, Indian River, and Cheboygan to Lake Huron. A coastal route, part of the Huron Shores Blueways, connects the City of Cheboygan to Mackinaw City and the Straits of Mackinac. 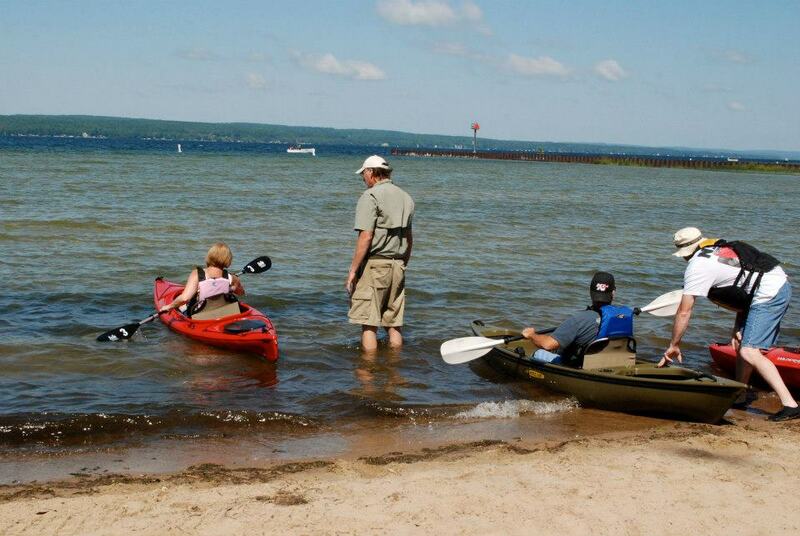 The water trails connect 7 state parks; numerous campgrounds, day-use parks, and resorts; 20 Little Traverse Conservancy Nature Preserves, and six communities. Combination paddle and pedal trips are possible since the North Central State Trail, North Eastern State Trail and North Western State Trail all parallel segments of the water trail. 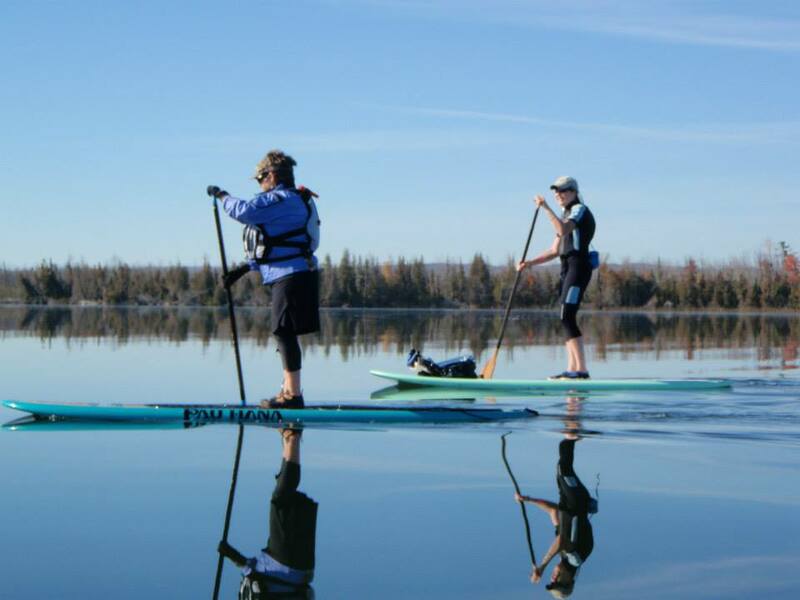 Using the interactive map below, paddle enthusiasts can get information on access sites, parks, campgrounds, nature preserves, historic sites, birding, outfitters and rentals, marinas, waterfront camping and waterfront resorts. For more lodging options and information on other communities amenities view chamber of commerce and tourism bureaus for Petoskey, Harbor Springs, Alanson, Indian River, Cheboygan and Mackinaw City. 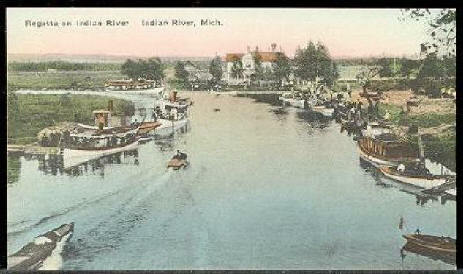 The Inland Waterway has long been a popular motor boating destination. Be prepared to share the water with speed boats, water skiing, and jet skis. Some sections can be congested during peak recreation times. Crooked and Indian Rivers – During peak summer times, motor boat traffic is very heavy, especially on weekends and during afternoons. Early mornings are the best times to paddle the rivers during summer months. Along the eastern waterfront of Mackinaw City, passenger ferry service combined with recreational boat traffic creates difficult paddling conditions during peak tourism times. It is recommended to explore the interesting waterfront during early morning hours and off-peak times. The winds and currents within the straits can create difficult water conditions and therefore should be explored by experienced paddlers. Burt and Mullett Lakes are large bodies of water and, similar to Lake Huron, paddling in storms and heavy seas is very dangerous. Always check the weather forecast before setting off on a paddle trip. High winds and especially fast-moving thunderstorms, with associated high winds, heavy rainfall, and lightening, can turn a pleasant day into dangerous event. For additional information on kayaking safety, paddle maps, history, and the Water Trail Plan, download files below. City Boat Launch at the end of Elm Street in the community park. Oden Island Road access on either side of the bridge. Spring Lake Park - Not a good access point. The Hiawatha Hotel (later called Hiawatha House) was built in 1900. 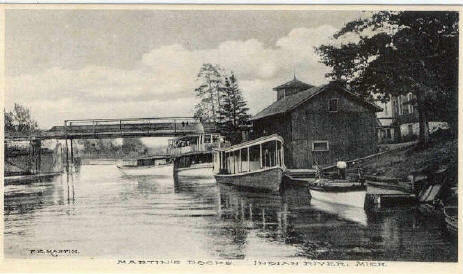 City of Cheboygan, was the northern gateway into the inland waterway. Oden was considered a resort center. Year round residents were clustered along main street. Topinabee was a planned resort community. Pikes Hotel, later named Hotel Topinabee. The structure no loner exists. Resort with 6 cabins sits on 2 � acres of landscaped lawn, fronting one side of Michigan's famous Inland Waterway, on the Indian River.